Virtually unchanged for decades, the humble ski underwent radical changes in construction and performance at the beginning of the nineteen nineties. Traditionally long and skinny, the pointy end went to the front and the length was as far as you could reach with your upstretched arm. Those who were better than average would often get even longer skis partly in some cases so that the piste based community was in no doubt that they were in fact better than average. Then along came snowboards and changes in design that tore up the rule book and started afresh. across the middle. The sidecut defines a turn radius that a ski will be good at. All other things being equal the greater the sidecut the more likely that a ski will be better at short radius turns. A ski with a bit less sidecut would generally be expected to perform better at longer radius turns. Many skis now have a radius printed on the top sheet. The torsional stiffness or how much a ski twists along it’s length determines how well it will hold the edge steady on harder or icier snow surfaces. Skis designed for powder or off piste conditions will be softer than slalom racing skis which are designed for hard icy race courses. When buying skis make sure to pick something appropriate to your ability and probable usage. A ski which is too stiff will be unforgiving of minor errors and liable to catch an edge conversely one which is too noodle whilst great in powder will tend to skid on firmer snow and cause worrying levels of insecurity on icy traverses. The longitudinal stiffness also affects the performance of the ski and will broadly speaking match the torsional flex and sidecut. The good news is that there are almost no bad skis on the market any more. 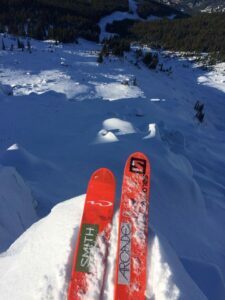 The days of beginners packages which were of no use beyond the first few days on snow have hopefully gone for ever and modern skis perform well over a much wider range of conditions than ever before. There are three methods of constructing a ski which account for almost every ski on the market today. Over the years a lot of bar room waffle has expressed preferences for one over the others for a variety of (often mutually exclusive) reasons but ultimately the people who made high quality enjoyable to use skis with one method back in the good old days are the same people making high quality enjoyable to use skis with a different method here and now. The important thing is not the method of construction but the care and attention to detail which goes into the design and manufacture of the ski. pressure often for many hours. On being released from the mould the rough edges would be trimmed and the graphic top sheet added. Ski cores are made from a variety of materials and often involve a main material of wood or foam combined with glass or aramid fibres, aluminium and resin. Wood is the traditional core material and is still one of the very best at damping vibration and smoothing out the ride of a ski especially on harder icier snows. P.U. foam is cheaper, easier to work and very effective although the performance is not quite as durable over the life of the ski. Acrylic foam is extremely light and is often used for touring skis where light weight is extremely important. Aluminium and other honeycomb cores tend to be used in specialist top end skis such as those for cross country racing where extreme light weight is a pre-requisite. This is quite an expensive way of making skis and a lot of the work involved cleaning up and finishing the ski once it had come out of the mould. Adding and smoothing the graphic top sheet could be the single greatest expense and yet add nothing to the performance on the slopes. Nowadays there are some excellent sandwich construction skis on the market but almost all are toward the upper end of the price spectrum. Appearing on the scene from the end of the nineteen eighties this was very much the new kid on the block. Consisting of vertically laminated, pre-shaped wood or synthetic materials, wrapped in glass or carbon fibre to produce a torsion box core over which a plastic or metal sheet would be placed, covering the top of the ski from edge to edge. The cap construction has rapidly become the norm. The “Cap” top sheet is already printed with the ski graphics and needs minimal tidying up before the ski is ready for the shops. Performance can be excellent and cap construction is found in every type of ski from beginner to Olympic racer. Metal caps are rarer than plastic, often a bit more expensive and although they are sometimes claimed to be more responsive or stable or better in various ways they have struggled to survive as anything other than a niche product possibly because the most noticeable feature of a metal cap is that the ski becomes significantly heavier. Outwardly this style of ski resembles a cap ski. The difference lies under the surface. rather than a sheet of plastic pressed around the ski core monocoques consist of a shaped shell made from composite materials. The strength and integrity of the ski comes from this shell and the core materials perform the secondary function of damping vibrations and filling space. This is a highly technical method of ski making involving a complete revamp of production systems and tooling and few companies have gone to the trouble to change over to this kind of production when other methods work well but monocoque skis perform well, last well and are very reliable. Most skis of this type are in the middle and upper ranges. Which of these is the best way to make a ski? It’s the wrong question as the answer is more down to the quality and design of the ski rather than the construction method. Poorly made caps are easily chipped, delaminate and perform badly. Cheap sandwich construction skis can bend, delaminate and split easily. Outright poor monocoque skis pretty much don’t exist as this type of construction tends to produce reliable performance and durability. The reality is that once you get beyond “bargain” cheap skis it is virtually impossible to buy a bad ski. 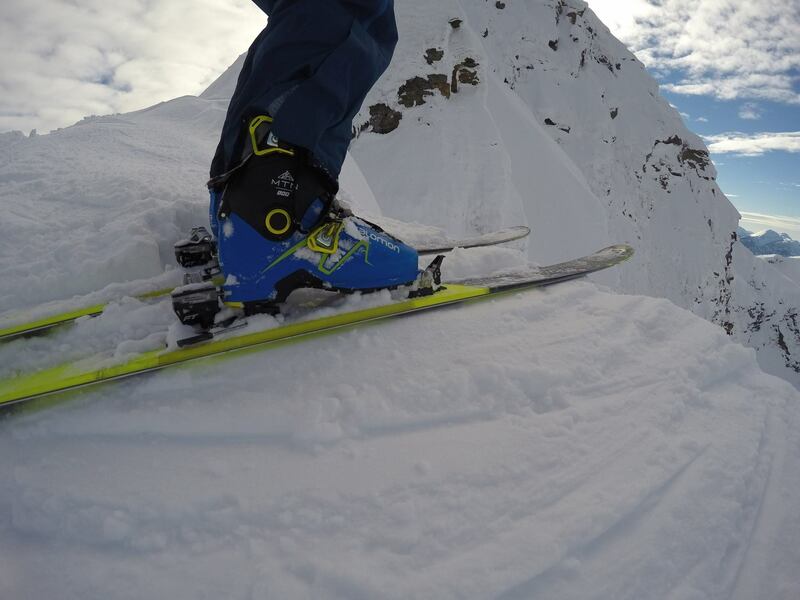 The best ski manufacturers all produce great gear for a range of skier types and abilities. The best ski is the one that most suits your ability and ambition not necessarily the dearest or the funkiest new design.